Is a Doula a useful member of the team for a cesarean birth? 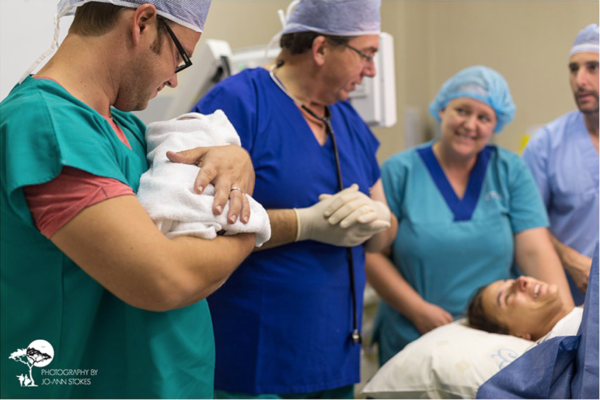 There is no other major surgery of it's kind where you will be handed a newborn baby immediately afterwards and expected to care for it, and there are very few other major surgeries where you will be wide-awake and fully conscious of what is taking place. 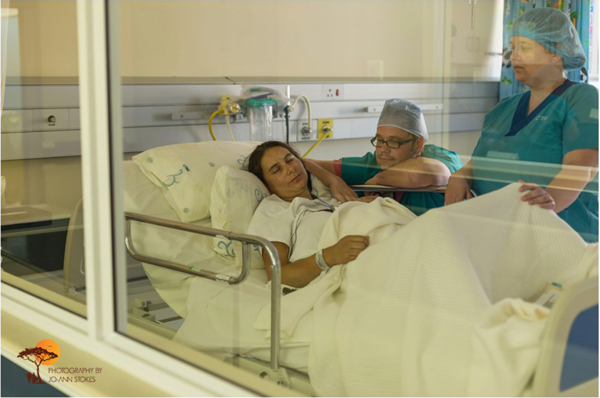 A c-section is a very remarkable and sometimes overwhelming experience for both the mother and the father, so having a familiar, caring presence with you during surgery can offer immense relief to both parents. While many medical professionals question the need for doula support during an elective c-section, for the reasons already stated above it becomes somewhat of a “no brainer” to have a Doula present. When an unscheduled (aka “emergency”) c-section becomes necessary, the mother may still have some time during which she is required to continue coping with a difficult labour and so a doula is able to keep her going until pain relief can be administered. The pre-admission area can also be quite busy and add to the stress of the father – especially in the event that things have not gone according to expectation. This can also be a time of disappointment at some unexpected twists and turns in the path – and I see part of my job as giving both parents a chance to express their feelings since, as a doula, I’ve spent a great deal of time fully trying to understand their hopes for such an important day in their lives. Providing that calm, reassuring presence during this time, and allowing parents to express fears, concerns and worries about surgery need to be addressed right at that moment – and no other person present is usually in a position to do this. Once in theatre, your doctor and other medical team members around you will be focused on their own tasks. It can give both the mother and father a huge amount of relief to have someone truly focused on their well-being and immediately able to answer any questions about all the strange sensations that go along with surgery. Having had a c-section myself, I remember clearly how vulnerable I felt laying naked on the operating table with so many people around me – all of them very busy! My partner was with me but was equally helpless to understand what was going on or explain it – and while my wonderful doctor was busy with her work, she was hardly in a position to really offer support over the top of the screen and from behind a surgical mask (which made hearing anything she said almost impossible). I was surprised to realise just how much of what was going on that I could actually feel, and I could even still manage to move my toes despite the spinal anesthesia. There was a lot of tugging and movement, along with a big drop in my blood pressure, and perhaps the oddest sensation was when a great deal of pressure was applied to my stomach but I only felt the pressure up towards my shoulders. I was quite terrified at this point! When providing doula care to someone during a c-section, I am continuously checking in with the mother as to what she’s feeling. For the father, I make sure he’s not feeling too overwhelmed by all that’s going on – especially if he’s someone who is a bit squeamish around blood (which is about 95% of the Dad’s I’ve met so far). Some fathers who are particularly squeamish have chosen not to go into theatre at all and are relieved that someone close to the mother can still support her. Once the baby is born, it’s now the Dad’s job to go with him or her to the resus area where the peadiatrician will do a variety of tests and ensure that the baby is beginning to breath well. Without a doula, the mother is often forgotten about to some extent, and most of the time she is unable to see her baby or know exactly how things are going. The doctor will be busy removing the placenta and then beginning the approx. 45min process of closing up the incision. This is a great time to have a doula there to be able to have a better view of how the baby is doing and to let the mother know. I also make sure to take photos of whats happening to the baby and then show them to the mother right away, so that she can still feel connected and part of the process. This offers a great deal of reassurance to the mother! Should all be well with the baby s/he can be brought to the mother and placed on her chest. Should there be a problem, the father will accompany the baby to nursery and the doula will stay with the mother. When the baby stays with the mother, having a doula can mean that skin to skin with the baby is possible the moment they arrive in the recovery area, and that breastfeeding can begin. This may be one of the most difficult positions in which to try and breastfeed, but ensuring that latching takes place within the first hour can make a huge difference in future success as it’s when the baby is most primed to do it. Although difficult, the positive reassurance from a doula can help make the mother feel much more adequate despite how challenging things can be at that moment. Should there have been a need to take the baby to the nursery for further observation, having a doula to go and enquire on behalf of the mother can speed up the process of reuniting them. In the very least, it gives the mother a voice in a place where she can’t be (but so desperately longs to) and her doula can also then return as soon as possible to give her an update on what is taking place. Sometimes it is through the doula that the baby can still join the mother in her room by wheeling in the incubator, so the mother can see and touch her baby in the very least. In most cases a doula will simply be helping the mother get settled into her room, and adjusting feeding positions to try and get breastfeeding going. Other jobs might be organising something to drink for the mother, or the father, and taking a few family photos. 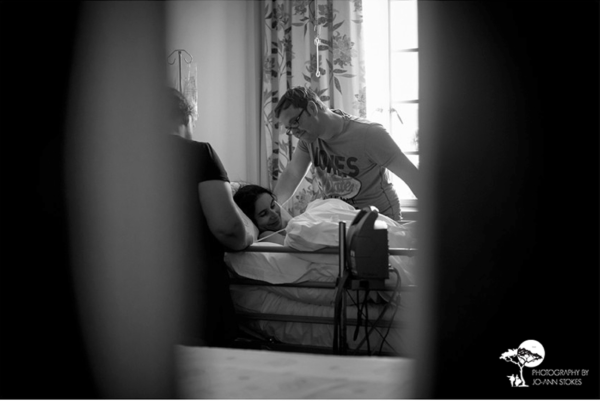 Obviously the role of a doula extends far beyond the birth itself, as a doula will continue to visit the mother both in hospital and then later at home. She can offer a helping hand with other breastfeeding issues that may come up, keeping an eye on the third day blues (to avoid Post Natal Depression) and sometimes to help with the first bath or to answer questions about any newborn skin issues. As you can see, there is still a huge amount of value that a doula can provide during a c-section – both before and after!